Clinicians who have struggled with vicarious trauma and compassion fatigue have found ways to care for themselves with the tenderness they do their clients. Why can it be difficult for social workers to establish and maintain self-care practices, including seeking professional help, especially given increasing awareness of compassion fatigue and vicarious trauma? Numerous terms are used to define the conditions of professional depletion in which social workers and others in caretaking professions are not performing at their best. Compassion fatigue, secondary traumatic stress, and vicarious trauma are becoming increasingly well known within the profession. In 2008 the delegate assembly of the National Association of Social Workers approved a policy statement, "Professional Self-Care and Social Work," which offers the following definitions, elaborating that "the common characteristic is that they represent the negative, unwanted psychological effects of the experience of helping and therefore, uniquely affect the helping professional." Violet Cox-Wingo, LISW, chief of social work for the VA Tennessee Valley Healthcare System (TVHS), has served as a social worker in the VA since 1981 and as VA TVHS chief social worker since 2007. In 2009 she was honored as the VA's National Social Worker of the Year, an award that recognizes excellence in services and commitment to advancing the core values of social work practice. Cox-Wingo's vision of excellence in service to veterans entails a holistic vision of wellness in the relationships between veterans and service providers. In her administrative role, she is very aware of the phenomenon of compassion fatigue, which has been defined in NASW publications as "the natural, predictable, treatable, and preventable unwanted consequence of working with suffering people, that is, the cost of caring." In reflecting on her decades of service in the VA, she believes compassion fatigue and secondary traumatic stress are better recognized today, though still as challenging to manage. "Compassion fatigue is not just stress. It is the utter depletion of a person's physical, emotional, and spiritual resources to the point there is nothing left to give. This is good for no one, including the organization." Cox-Wingo's interest in compassion fatigue came after recognizing that the reasons an employee might be at risk for compassion fatigue extend beyond the workplace. "Caregiver stress is a major factor given the demographics of our workforce," she says. Employees in the cohort who are caring for aging parents while still raising children or supporting economically dependent young adults are likely to carry added caregiving stress into the workplace. "Cultural changes have stacked the deck, so to speak, in a way that wasn't the case 20 years ago, which adds stress in the lives of many employees before they even report to work. I think that's all the more reason to support balance in our lives." While research shows that professionals in many caregiving professions are at risk for compassion fatigue, she adds additional caution to social workers. "Social workers have a tendency to think with the heart, and that's what can get us into trouble if we're not careful, especially if we are becoming overextended. If we are not balanced, we have a tendency not to say no." Social workers have a responsibility to "practice the art of self-management," she says, which enables workers to "become proactive as opposed to reactive." In response to compassion fatigue, the TVHS has implemented numerous programs to help employees restore and maintain the resource of self. TVHS offers patient-centered care classes, including a focus on self-care and mindfulness, flexible work schedules, telework, child care centers, facility-based exercise programs, employee assistance programs, a healthy options cafeteria program, and a farmers' market. Cox-Wingo encourages all varieties of self-care, especially self-compassion, and counsels colleagues to "accept where you are on your path at all times." NASW publications have defined vicarious trauma as "a cumulative transformative effect or condition experienced by trauma therapists as they work with specific populations of survivors of traumatic life events." Dana Branson, PhD, LCSW, at Family Counseling Center in Cape Girardeau, Missouri, an expert in field of vicarious trauma, notes that the characteristics that enable therapists to offer effective therapy to trauma survivors are the same characteristics that predispose therapists to the development of vicarious trauma. These characteristics include empathy, a nonjudgmental attitude, sensitivity, hypersensitivity to injustice, and a self-sacrificing mentality. According to Branson, as clinicians listen to disclosures of trauma details, including imagery, tactile sensations, smells, and sounds, they may create their own internal understanding of the event, and encode the clients' traumatic event into their own cognitive schema and worldview, thereby developing vicarious trauma. Vicarious trauma often develops over time, so clinicians are not aware of the subtle changes in their own mindsets. Branson says symptoms of vicarious trauma include "cynicism, anger which is often misdirected at clients or coworkers, irritability, avoidance of certain types of clients, missing work, avoidance of disclosure, anxiety about new client disclosures, decreased productivity, or in extreme cases, leaving the field." She adds that symptoms may also include "feelings of hypervigilance for safety, feelings of sadness or depression, intrusive thoughts or images, bad dreams, avoidance of intimacy, pessimism, and escapism." Social workers experiencing such symptoms may not identify their experience as "vicarious trauma" or know how to describe what is occurring effectively. Most often, Branson sees a tendency for clinicians "to say things like, 'I just need to bear down, work harder, just get through this phase,' with the assumption that 'things will get better' or that 'I will get some relief.' However, as symptoms of vicarious trauma worsen, social workers with this erroneous mindset tend to work harder and more hours, further isolating themselves. They tend to think that once they get through a difficult period, the issues will resolve themselves. Of course, this is a vicious cycle, and symptoms actually worsen," she says. Instead, she encourages clinicians to implement self-care practices throughout the day. "Even before vicarious trauma sets in, prevention and effective interventions can be difficult for social workers to put into practice because the individual's automatic thought tends to be something like this: 'Helping others makes me feel good.' We need to spend some effort challenging that thought and replacing it with something to the effect of this: 'Taking care of me feels good,'" Branson says. In cases of vicarious trauma, the worldview of the clinician is affected, which can alter the clinician's view of power and agency in the world. In extreme circumstances, the worker may take on a mindset of helplessness or powerlessness, even with regard to his or her own self-care. Reversing this cognitive process is a crucial step in seeking help. Ann Fisher Raney, LCSW, CEO of Turning Point Behavioral Health Care Center in Skokie, Illinois, is pioneering an administrative approach that integrates principles of adaptive leadership and mindfulness in the operations of an urban community health center, while emphasizing self-care for all employees. This approach has enabled the organization to achieve program innovation and financial stability, as well as national recognition as the 2015 recipient of the Excellence in Behavioral Healthcare Management Award from the National Council for Behavioral Health. This award recognizes Turning Point's Living Room program, which provides adults in psychiatric crisis a calming center to avoid unnecessary trips to a hospital emergency department. The program has a high success rate: After visiting the Living Room, 97% of guests did not visit an emergency department. Raney believes "it is up to the organization to get out in front of the conversation on self-care among our employees. Self-care concerns us daily." While self-care ultimately comes down to individual choices and behaviors, she thinks the culture of the workplace has tremendous influence on the social worker's preponderance to develop habits of wellness. At Turning Point, a primary element of self-care is the practice of mindfulness, which is integrated throughout administrative practices. In describing mindfulness in a case study on Turning Point in the Clinical Social Work Journal, Raney wrote, "A first principle essential for the success of this approach is the use of experienced clinicians as administrators: there is no hierarchy or exemption from rigorous self-reflection and from self-care for any agency member, and administrators have literally 'been there', serving clients, participating in supervision and consultation, managing the changing demands of paperwork and audit reviews" (Raney, 2014, p. 313). She continues to note that what results is a critical dynamic in which both clinicians and supervisors value self-care. The organizational value is codified through benefits commonly offered in social services benefit packages (generous paid time off, subsidized tuition for continuing education), as well as benefits unique to Turning Point, such as clinical consultation groups, social gatherings featuring ethnic dishes highlighting the diversity of cultures represented in the community, an annual agency sponsored "self-care day," and an externally facilitated strategic planning retreat which is held every five years. The annual self-care day includes a morning discussion forum followed by breakout sessions on health promoting activities such as yoga, stretching, art, acupuncture, knitting, etc. Additionally, the agency takes numerous measures to encourage communication between staff and administration, to invite comment and critique, and to make decision-making as transparent as possible (Raney, p. 314-316). Raney defines self-care as "the joining of an awareness of one's self with the available resources with a plan for maintaining wellness." In keeping with the practice of reflection, the awareness of self is a key component of self-care. What makes an activity "self-care" for a particular person is the "goodness of fit" between an individual's needs and what that activity offers. Raney notes that refining the understanding of one's needs as well as available resources is "an ongoing project which should be a topic covered in supervision," observing that the conversation will evolve over time. "Self-care is a two-way street. Our clinicians and supervisors are in continuous conversation, of course, as one component of the supervisory process. But the point is that maintaining wellness is always on the table." While a focus on self-care comes with a financial cost to the organization, Raney fears that having staff become isolated or depleted by compassion fatigue comes at a larger cost. She acknowledges that the stresses of community mental health are inevitable, from the hardships of caring from individual clients in crisis, to the budgetary crisis at city and state levels that threaten the viability of the community mental health system. However, devising innovative programs, such as the Living Room, requires creative thinking, and Raney fears an organizational culture in which "employees are not encouraged to bring forward ideas that are risky." She finds that employing the principles of adaptive leadership and mindfulness are exactly what allow clinicians and administrators to step toward the unknown, to look at crises as opportunities, to maintain nonjudgmental attitudes when considering new ideas, to engage with unlikely partners, to tolerate disappointment, to have the patience which allows solutions to emerge, and ultimately to thrive in today's environment of collaboration. In the process, she sees her role—and that of a social work administrator—as creating an environment in which "people who want to do this work are as happy and feel as supported as they possibly can." The perspectives described by Cox-Wingo, Branson, and Raney align with several of the standards endorsed by NASW in the 2009 policy statement on Professional Self-Care and Social Work. NASW believes that professional self-care is "an essential component in competent, compassionate, and ethical social work practice, requiring time, energy, and commitment." Recognizing the obstacles that many social workers face in developing and sustaining self-care, a variety of resources exist to guide social workers in the development of self-care plans. 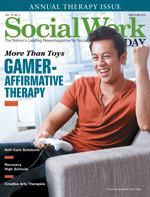 Social Work Today featured several such resources in an article titled "Social Worker Self-Care — The Overlooked Core Competency" in the May/June 2014 issue (www.socialworktoday.com/archive/051214p14.shtml). In addition to individual responsibility for self-care, NASW recognizes a level of organizational responsibility to promote environments in which self-care is a supported professional practice and elaborates several standards for the establishment and promotion of policies, resources, programs, and supports that promote constructive workplace environments and employee wellness, given the inherent demands of the profession. Among other provisions, NASW's policy statement emphasizes "the promotion and support of the practice of professional self-care by social work administrators. Social work administrators can demonstrate support for self-care by reflecting self-care in policies and in the process of evaluation; offering supportive supervision, ongoing processing and debriefing after traumatic or stressful occurrences, staff retreats, team building with a focus on rejuvenating social work staff; and actively sponsoring healthy lifestyle activities within the work environment, such as walking, running, aerobics, healthy eating, encouraging time off, taking breaks and mental health days, and providing relaxing and nurturing environments for meditating" (NASW Press, 2009). However, for a variety of reasons social workers may find themselves in work environments that create demands that exacerbate conditions of professional depletion. Social workers may feel a stigma about tending to self-care practices or taking the step of seeking professional therapeutic help. In such cases, a step toward self-care may be to set clear boundaries between professional and personal time. As Raney notes and NASW reinforces, while self-care behaviors are ultimately the responsibility of the individual, the organization bears some responsibility to create a culture that supports and values wellness. Recognizing this shared endeavor may be destigmatizing and provide encouragement to employees to take advantage of existing benefits, including employee assistance programs, and possibly collaborate with colleagues in proactive ways to advance self-care initiatives. Despite growing awareness of compassion fatigue, secondary traumatic stress, and vicarious trauma, education and prevention information could be more accessible across the profession. As Branson points out, many workers may not be aware that their experience is actually best characterized as symptomatic of these constructs, and this knowledge can be destigmatizing in and of itself. When social workers can see their experience through the lens of a common, treatable, and preventable condition, as opposed to an individual deficiency, the effect can be to lessen the stigma and burden. Additionally, as more clinicians develop specialization in treating other clinicians affected by vicarious trauma, this may inspire confidence in seeking help. Finally, whereas stigma generally has the effect of isolating people based on fear, social workers struggling with the effects of compassion fatigue and vicarious trauma may be well-served to think of "overcoming" in the sense of "joining" or coming together in improved relationships both with self and with others, in an ongoing process to nurture the resource of self and sustain the capacity for clinical work. — Liza Greville, MA, LCSW, is in full-time clinical practice and a contributor to Social Work Today. NASW Press. (2009). Social work speaks. 8th ed. Washington, DC: NASW Press. Raney, A. F. (2014). Agility in adversity: Integrating mindfulness and principles of adaptive leadership in the administration of a community mental health center. Clinical Social Work Journal, 42, 312-320.